The purpose of this review is to help doctors in the management of patients with post-polycythemia (PPV) and post-essential thrombocythemia (PET) myelofibrosis (MF) facing diagnostic criteria, prognostication, and treatment possibilities. Diagnostic criteria of primary myelofibrosis (PMF) have been recently updated from the WHO classification. A clear-cut distinction between pre-fibrotic and overt PMF has been done. Concerning PPV and PET MF, the criteria come from 2008. Prognostication of PMF has been well established on clinical criteria, but recent molecular acquisitions will improve the strategy. For PPV and PET MF, the new MYSEC-PM is helpful for prediction of survival. JAK2-inhibitors and stem cell transplant are the two critical therapeutic approaches in myelofibrosis. Differences between PMF and SMF substantiate the efforts underway to adequately stratify SMF patients with ad hoc prognostic tools and to use such categorization to evaluate available treatment modalities. Guglielmelli P, Lasho TL, Rotunno G, Mudireddy M, Mannarelli C, Nicolosi M, et al. MIPSS70: mutation-enhanced international prognostic score system for transplantation-age patients with primary myelofibrosis. J Clin Oncol. 2017; https://doi.org/10.1200/JCO.2017.76.4886. Barbui T, Tefferi A, Vannucchi AM, Passamonti F, Silver RT, Hoffman R, et al. 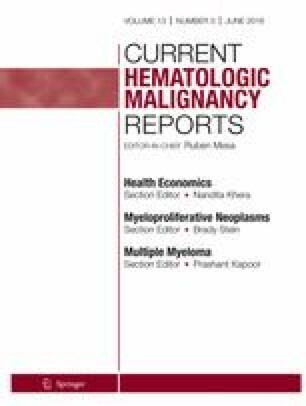 Philadelphia chromosome-negative classical myeloproliferative neoplasms: revised management recommendations from European LeukemiaNet. Leukemia. 2018; https://doi.org/10.1038/s41375-018-0077-1.